It’s a Swedish tradition to leave money outside your front door overnight on the 31st December. It’s supposed to bring you money in the New Year. I don’t believe in superstitions but I’ve joined Miss FFBF for the last three years and I’ve decided to do things a little differently this year. The actor Jim Carrey, and motivational speaker Jack Canfield believe in the ‘Law of Attraction’ and wrote cheques for $100,000 for themselves before they had ‘made it’. They put it in a place they would see it everyday, and focused on receiving that sum of money. Eventually they both earned that amount, and wrote cheques for higher amounts. If it’s good enough for Jack and Jim, it’s good enough for me! 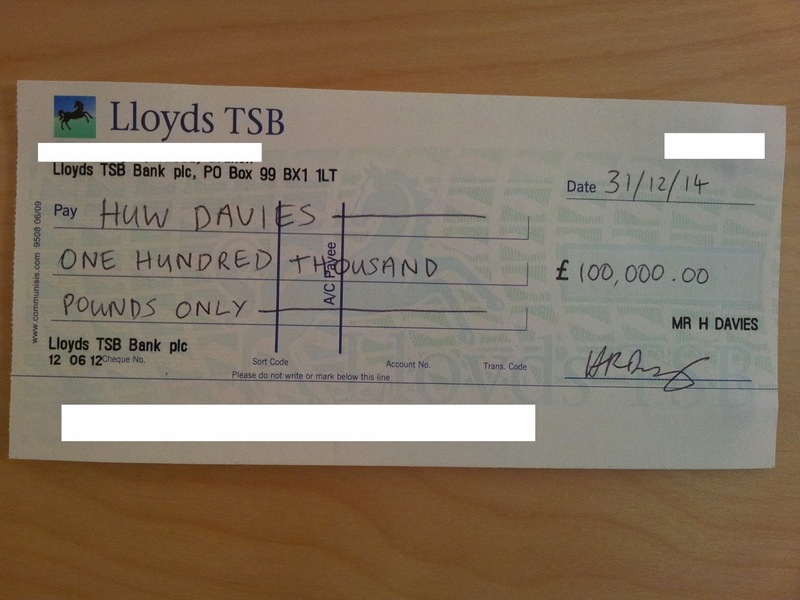 I wrote the cheque above and I plan on putting it outside my front door on the 31st December. I’ve placed the cheque on a set of drawers next to my bed for now. I look at it at least twice a day and I plan on returning it to the same place in the New Year. I’m intent on receiving that sum of money over the course of a year. It might not happen this year, but it WILL happen! I’ve achieved all four of my intended financial goals for this year, including the Version 2 and 3 Targets. I will be publishing a breakdown of the ‘Results’ and ‘Learning Outcomes’ once the month has passed and I have my final numbers for expenses. I made a start on the review, and during the process I found that I’ve become exceptionally good at managing money. Once I have money in my possession, I’m very good at saving/investing it and I choose not to spend it. It’s also highlighted that I’m currently very average at making money. My income is above the national average (approx £30,000 per year), but it’s far from exceptional. My ‘side hustles’ are making an impact, but if I was able to make more money from them, my investments, dividend income and time to become FI would benefit from the back end. I’ve decided to make 2015 The Year Of Making Money. Can I achieve the same success as I have experienced over the years with reducing expenses? Can I double my income? Can I make a living online? There’s only one way to find out……. I might be average at making money at the moment, but I have a lot of confidence in my ability to set Goals and to achieve them. If I set my mind to something, I usually accomplish it. If I’m unable to achieve it, I’ll be very close. My 2015 goals are across all the areas in my life, and some of them are very ambitious (there are other words to describe them too!). I’ve been specific and I’ve set a time frame to all of them. I will perform a weekly review where I’ll check on my progress to these goals. I’ll see what’s worked, what hasn’t, what I need to do to keep on track, and make any necessary adjustments. I’ll post a ‘Goal Update’ on a Monthly and Quarterly basis on this Blog to show my progress. I will earn at least £50,000 in income by 31 December 2015. I will earn at least £1,000 per month creating and selling Kindle e-books by 31 December 2015. I will have a ‘Freedom Fund’ worth over £50,000 by 31 December 2015. I will receive £2,000 in dividend income by 31 December 2015. I will create and sell at least 50 Kindle e-books on Amazon by 31 December 2015. I will become a money coach in 2015. I will have three separate ‘trial sessions’ with people I know and three separate ‘paid sessions’ with people I don’t know by 31 December 2015. I will hit 100% of my Bonuses (three in total) for 2015. I will help all 7 people in my team develop by supporting them achieve at least one personal goal – Attend a course / get a promotion / hit a personal target etc by 31 December 2015. I will enter and compete in a Bodybuilding event in 2015. I will record my daily macro-nutrients in a nutrition diary for at least one month. I will squat 175kg, I will Bench 120kg, and Deadlift 200kg. I will perform a weekly review, on the weekend, for the whole of 2015. (52 weekly reviews). These sessions will focus on my progression towards my Goals. I will have at least a date and location organised for our wedding by 31 December 2015. I will go on two holidays with Lou for at least two nights each by 31 December 2015. I will visit three long distant friends – JB, RF and JD by 31 December 2015. I will contribute at least £250 towards charity for by 31 December 2015. I will have 150,000 all time page views on my Blog by 31 December 2015. I will consistently average over 10,000 page views a month by 31 December 2015. I will organise two UK Gathering for FI/PF Bloggers and readers by 31 December 2015. I will happily start and build Email list for Blog by 31 December 2015. What do you think? Have you set your goals for 2015? How are you going to make sure they happen? Publishing 50 e books seems like a mammoth task! Good luck and will be following with interest. £1,000 per month would be awesome. Sure you'll smash the squat and DL goals. I have similar (but lower) goals for next year. I serious list of goals you have made there. I hope you can achieve all of them, and look forward to you progress on your side hustles as although I am reasonably well paid, I would also like to add to my income and then be able to invest all of this additional income. Yes, I went on a bit of a rampage with what I wanted to achieve this year. I hope I can achieve them all, there are some that are more important to me than others. The Income, Kindle, Money Coach, and review sessions are right up there for me. It was difficult to think of specific and measurable goals for my job, and I hope I'm able to help my team out with their goals this year. Ha ha – I love the mushroom management style. I've not heard of that before! Thanks for the well wishes, and all the best to you too! Thank you for the support. I really appreciate that! Yes, I've pushed the boat this year. I surprised myself with what I've achieved this year and I want to test myself and see what I'm made of. It excites the hell out of me to think if I can do this or not. If I can stay healthy and not encounter any significant injuries, I'm confident I can hit my physical goals this year. Do you mind me asking what your strength goals are? Where are you currently at with them? There wasn't a duplicate don't worry. Thanks again for stopping by. I wish you all the best your 2015 goals too! Wow, you've got quite the year ahead of you by the looks of it. That's exactly the type of determination that 's behind all great achievers. I need to clean up my game and dream bigger too. I'd say it be quite the accomplishment even if you only completed 50-75% of the goals on you list! Wishing you the best as you tackle your 2015 goals! Thanks for stopping by. Yes, I have some big plans for 2015. I put to push my boundaries for what I think is possible. It's a big step for me. I know I have the capability to achieve all of them, but only time will tell if I do it or not. It won't stop me from trying. I've put a lot of time into breaking all of the goals down into 6 month, 3 month, 1 month check points, so I know what actions I need to take at certain periods to work towards them. Thank you for the support. I wish you all the very best with your 2015 goals too! Wow, what a comprehensive and thorough list of goals. I wish you nothing but success as you push forward in both your business and personal life. I do have to agree with others when I think about 50 ebooks! That's almost one a week, on top of blog posting/etc. Heck of a lot of work indeed! Yes, I've set myself a bit target for publishing books. Thankfully, I won't be writing them myself, I don't think I would be able to commit to that number, and if I did the quality would be poor. I'll be outsourcing the work for other people to write, so I can focus my time on other actions. You're right, I'll need publish 4.1 ebooks a month, I want to shoot for 10 in January to see if I can turn around the work that quickly. Wish me luck! All the best with your 2015 endeavors! Wow, that's an impressive lists of goals there – the best of luck to you in achieving them! I think if I set myself so many, I'd end up being either overwhelmed (get stressed over them) or I'll get too distracted to achieve them all! Well done for putting them out there and being accountable though. Am loving your positive attitude! I'm in the middle of drafting my own goals but am finding that I'm being quite conservative – I blame it on the jetlag, so will revisit them before I post! The non-financial ones are very interesting, in particular your business ones – very interested to see how you do with the Kindle e-books and to read about how you get on with being a money coach. How did you get the idea to include these as your goals? Anyway, good luck – I look forward to following your progress on all of these! How the devil are you? I had a lovely Christmas thank you, how was yours? Did you have a nice catch up with your family? Thank you very much. I'm taking it up a notch this year Weenie, and I feel fantastic for it. I can honestly say I've not felt this motivated before. I don't know what it is but I think this is going to be a big transition year for me. I back myself when it comes to goal setting. I believe the trick is committing to something that has a 50% chance of happening. Usually the negative 50% is down to psychology. The truth is if you're 50% of the way to believing then you CAN do it. Goals should be a little scary or a little unrealistic. I'm wanting to improve my financial situation so I need to change what I'm doing. I'm hoping Kindle is the answer to it. I can't wait to get my tax code so I can start publishing them. I'll keep you all posted with my progress!! Wow that's a lot of goals for 2015 but to your credit you have made them very specific. Looks like you will be quite busy in 2015. You'll have to do quarterly updates to keep us updated on how you're doing with your goals in 2015. Looking forward to a great 2015! I'm great thanks, still a little tired from the flight but I had an excellent time catching up with the family! I like what you're saying about the 50% thing – perhaps I'll try to adopt that when I finalise my goals, though not sure how daring I can be haha! Sounds like you could be a 'life coach' as you've got all angles covered already. I just had a quick google and found https://nationalcareersservice.direct.gov.uk/advice/planning/jobprofiles/Pages/lifecoach.aspx – possible career change for the future!? Likewise, thank you very much for your support and for being a great friend 🙂 Your blog was one of the ones that inspired me to start up my own in the first place and I first heard about peer to peer and dividend investing from you, both now part of my investment strategy! Hopefully, 2015 will be a great year for all of us! Great list of goals. Incredibly ambitious. I've looked into doing an ebook or two, but I'd want to make sure the quality was absolutely top notch if I have my name on it. So I think I'd just publish a traditional book if I were to go that route. Perhaps not as profitable, but I'd feel better about the end product. That's just me. I'm glad you got back safely and had a great time with your family! I love helping people, and I've always enjoyed coaching from when I was a teenager to now, so I'll probably coach in some format in the future. I have a passion for finances and exercise so imagine I'll pursue those avenues to start with. Thank you for the link! I've looked into being a life coach previously and it does interest me. My thoughts are to become successful in investing, managing money, making money, physique building, health and fitness, and personal development to the extent people approach me for help. I will offer my services, but I want it to be a side job and not to chase it as a full time work or pay the bills with. I think I can help people now with managing their money and exercise, but I have some work to do on the others for now. Thank you for the kind words Weenie. That's very sweet of you. I hope we can continue to help each other in 2015! I didn't back this year, I went for it! Thank you for the support, I appreciate it. I see it in a similar way, if I'm unable to hit half of the goals, I'm sure I'll see progress in all areas, and for me that's the point of goal setting. I believe I've set my targets too low previously. I haven't shown what I'm capable of yet, it's time for action and to see what I'm really made of. I understand and agree with your sentiments on e-book creation. I created my first book with my name on it, as it's on a subject I'm passionate about – Positivity. I intend on creating several pen names when I launch my books on Kindle this year. I want to also create my own books for Kindle but I'm likely to keep the volume of those down to a minimum and to increase the length and depth of what I write about. That will likely be in 2016, once I've gained experience in the writing and publishing process. Creating Kindle books in 2015 is about making money and helping people. I want to create short books that help people in some way, but I won't hide the fact that it's about generating an income for me. I will eventually like to make books in my name that are about my passions, and aren't driven by making money. Thank you for the well wishes, and I wish you all the best for 2015 too! Yes, I didn't pull any punches this year. The three most important factors for me are making it measurable, specific, put a time limit on it. I place less value on realism/achievable as people differ so much psychologically and we humans tend to work towards Parkinson's Law – where we do what's required within the time limits regardless if it's tough or easy. I want to test my believes and see what I'm capable of. Personally, I'll be reviewing my goals on a weekly basis. I will write monthly and quarterly updates on all of the above. I think regular reviews are essential in order to achieve the Goals. If I review them every week the worst I'm going to have is a bad week. If I assess them on a quarterly basis only, the worst I'll have is a bad quarter. That might be enough to fail. Whatever you focus on you move towards. I want to focus on success this year! Thanks for stopping by and all the best with your goals! Thats a great set of goals and very motivational. I have to agree with other comments that 50 ebooks is way way to many. I've got some experience in this field and the best advice I can offer you is to focus on making each book the best quality possible. I'd say even 5 would be an ambitious target for the year. I wish you all the best and look forward to reading about you smashing through these goals throughout the year! I'm not planning on writing all 50 books, otherwise I would agree with you. I'll create a post on my process once I have a bit more experience and I prove what I can do. I've already produced a book that's ready to publish, but I'm waiting for a tax code before I can sell it. The process took 5 days. and I plan on getting more efficient with time. My books are short in length but they do help people. I plan on making at least 4-5 books a month, and I'd like to shoot for 10 books in Jan to see if that's possible. If I can make more than 50 books then great! I have 120+ ideas for books currently that I want to create. I think that list will continue to grow too. My idea is to produce books that pay back the cost of making the book in a couple of months, then everything else on top is pure profit. I'll then reinvest those profits into shares and creating more books. I have no problem with people doubting me, in honesty, it 'stokes the fire' and makes me more determined to prove I can do it. I appreciate the concern, genuinely, and I look forward to proving my method. I wish you all the best with your plans for 2015 too! Holy hell, Huw! That's a serious list you've compiled there! I'm impressed with how good you are at assessing yourself and your own areas of improvement. 2015 should actually also be the year that I focus on making more money, but it wasn't until I read your post that it hit me. How does making e-books and selling them on Kindle work exactly? I'm completely unfamiliar with that business model. Making over £1,000 every month by selling books seems like a lot of money, or is that just me? Good luck, pal! Really looking forward to see how this plays out. I'll create a Post on the system I've followed to create books on Kindle once I'm a little more established. I haven't sold one yet, as I'm waiting for a tax reference number. It's not complicated but there's more to explain than I can in a comments section. I agree with you too, £1,000 is a lot of money, for me anyways! I'm targeting this figure as it would cover my annual expenses, and I could make a decision not to work again if I wanted. It's a big ask for a year and only time will tell if I'm up to it. I'll keep you and everyone else posted with how I get on with it too. Thanks again for stopping by and showing support. I look forward to seeing you progress with your 2015 goals and making more money too! I really love that idea of the cheque to yourself. I'm a great believer in visualisation and positive thinking too, so I'm sure you will have much success in 2015. I'm hoping to squat 120 kg and DL 140 next year. Come February/March the cycling season will get underway so I won't go for it until the end of the year I don't think. Yeah, stretching goals are the way forward. Better to have a near miss with a tough goal than make it to an easy one. I wish you the best of luck with your lifting goals and the upcoming cycling season. I couldn't agree with you more on the difficulty of a goal too. I'd prefer to just miss out but be truly tested rather than easily walking over the line well in advance. I'm glad you like the cheque. I thought it's worth a shot, what I have got to lose. I do look at it everyday, and I could be going crazy but I'll achieve that in a year in my life! The Spring Meetup will definitely happen. I'm going to suggest a date later this month and hope we get a good turnout for it. I look forward to meeting you in person then! All the best with your goals for 2015. How are you going on the 2015 goals? I really like your list, I think we have similar minds! Especially love the positive vibes, we both believe you'll achieve everything on that list!